The Guinness Cork Jazz Festival are proud to present a power house double bill in the Curtis Auditorium at Cork School of Music. It’s been almost a year since Top Guitarist Frank Vignola catapulted into a tree from an off-road-vehicle in a tragic accident that nearly took his life. After being air-lifted to a renowned N.Y. area trauma center, Frank’s family learned of his extensive injuries which included four broken ribs, a broken clavicle, shoulder (in two places), and arm, which has since required multiple surgeries. Additionally, Vignola suffered two collapsed lungs and massive internal bleeding. 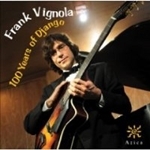 Enduring a long but steady recovery, Frank returns to the stage with “Frank Vignola’s Hot Jazz Guitar Trio”, in collaboration with long-time touring partner Vinny Raniolo, and the young and talented Jan Knutson. Frank Vignola, born December 30th, 1965, is one of the most extraordinary guitarists performing before the public today. His stunning virtuosity has made him the guitarist of choice for many of the world’s top musicians, including Ringo Starr, Madonna, Donald Fagen, Wynton Marsalis, Tommy Emmanuel, the Boston Pops, the New York Pops, and guitar legend Les Paul, who named Vignola to his “Five Most Admired Guitarists List” for the Wall Street Journal. Vignola’s stellar technique explains why the New York Times deemed him “one of the brightest stars of the guitar”. 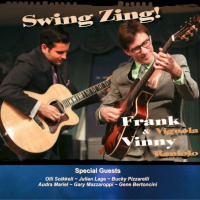 Vinny Raniolo's dynamic playing has brought him to 18 countries performing alongside Frank Vignola, Tommy Emmanuel, Vince Giordano, and Deana Martin. Raniolo has also been featured on three PBS Music shows including the heavily programmed Tommy Emmanuel and Friends, Frank Vignola's Four Generations of Guitar, and in the Music Gone Public series. Film and recording credits include soundtracks and on-screen appearances for HBO's “Boardwalk Empire”, Woody Allen's film “Café Society” and Martin Scorsese’s “The Irishman”. Kenneth F. Smith was born in Florida, USA and grew up in New Jersey and Abu Dhabi. Kenneth earned a B.M. in Performance from Arizona State University, and a J.D. from Brooklyn Law School. While living in Arizona, Kenneth worked as a soloist and ensemble member playing everything from solo classical guitar to theater productions, and toured extensively in Europe and the United States as a side man and leader. Kenneth moved to New York City in 1997 and has performed at venues including Birdland, Lincoln Center and the Village Gate, among others. Linley has been a part of the Irish music scene for over twenty years and since then he has juggled a career as a trumpet player with being a BBC Jazz Broadcaster and a Lecturer in Music at Ulster University Magee. There have been many career highlights in the past with significant performances or recordings with Paul Brady, Van Morrison, Foy Vance, Eleanor McEvoy, Jacqui Dankworth, ASIWYFA, to name a few, but he is working just as hard as ever these days and is celebrating success with his own recent albums ‘In Transition’ and ‘Taylor Made’ with his quintet which features Johnny Taylor piano, Damien Evans bass, Julien Colarossi guitar and Dominic Mullen drums. The album is available on iTunes and Amazon and from www.lyterecords.com. The last five years has seen a concerted effort to reroute himself in Jazz, having graduated from DIT Dublin with a 1st Class Masters in Jazz Performance and the celebrated Student Academic Medal, and followed that up with a PhD in Jazz Performance at Ulster University Magee...and is now Dr Linley Hamilton!!! The Radio Show is still going strong and has moved to a Friday night at 10pm on BBC Radio Ulster…the show called…Jazzworld with Linley Hamilton. There are weekly interviews and last year alone such guests have included Liane Carroll, Vince Mendoza, Adam Nussbaum and John Goldsby. Recordings in the past year or two have seen Linley guest on albums by Ronnie Greer, Anthony Toner, Ex Magician, Malibu Shark Attack, ASIWYFA and Dana Masters. The big news is that Linley has just recorded his biggest album of his career to date…Linley Hamilton – Making other Arrangements…on Teddy D Records…its release date is 23 March 2018 and is with a large ensemble including full rhythm section, saxes, woodwind and an 11-piece string section.